Newton & District Jubilee Rotary Club, serving Culcheth, Winwick, Croft, Birchwood, Locking Stumps and Glazebury will be present at Culcheth Community Day on Monday 6th May and later in the year at the Croft and Winwick Carnivals. You can PLAY YOUR CARDS RIGHT at Culcheth and Winwick, and try our COCONUT SHY at Croft. Please call in for a rest and chat at the Rotary tent (see Photograph). You can also inspect a SHELTER BOX which contains a 10 person tent, a solar light, a stove with cooking utensils, thermal blankets, a water purification unit, mosquito nets, tools and childrens toys etc. These various items cost anywhere between £7.00 & £300.00 and we offer YOU the chance to donate an item to a Shelter Box and help give vital relief to A FAMILY SUFFERING IN A DISASTER AREA somewhere abroad. The PURPLE FOR POLIO project supported by the Bill & Malinda Gates Foundation is another Rotary cause now close to eradicating this terrible disease from our planet. 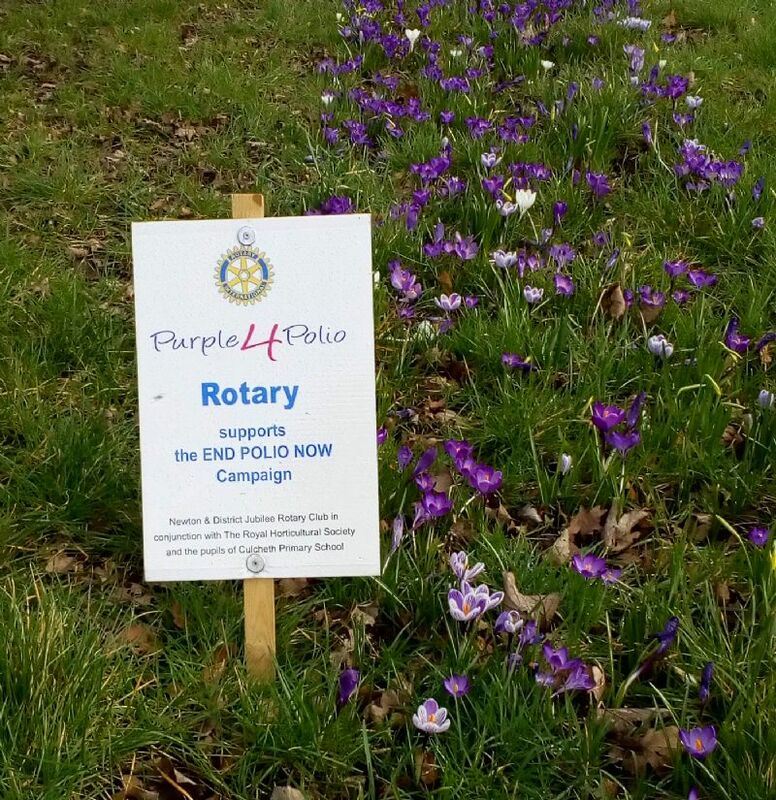 You may have seen swathes of purple crocuses by the roadside in Croft, Culcheth and Winwick. Planted by the children of those villages in aid of this project, we are sure that, with justifiable pride, they will have watched them multiply and flower, year on year. We thank them all for their support and for brightening our springtime (see photograph taken at Warrington Road, Culcheth). The recent provision of a covered Sand Table at Croft Nursery and two Bench Seats for the new Playground at Glazebury Primary School are small examples of Rotary helping in societ, but these and many major projects, at home and abroad, will always need funding. With that in mind, we are pleased to announce that the 2019 CULCHETH BEER FESTIVAL will take place on Friday 13th & Saturday 14th September, as usual, at the Culcheth Sports Club. We invite the usual enthusiastic support of Hop, Cider Gin & Wine connoisseurs. So please make a note of the dates, come, Eat, Drink & be Merry whilst helping us to help others. Now meeting & eating at the Culcheth Sports Club (Daten) on Tuesday evenings, we are looking for new members to help with our important and enjoyable work. Join us, make new friends and extend your social life whilst putting something back into society. Our details are on Facebook, Twitter and the Rotary District 1285 web site. Otherwise, contact Bernard Groom 01925 733893. You will be most welcome.